[In part 1 of this article, we looked at the abrupt climate change scenario leaked from the Pentagon. We noted the authors' recommendation that the President should elevate abrupt climate change to a national security issue. And we observed that the Pentagon's next move was an effort to back off from the report's conclusions and ultimately bury the report. The Bush Administration has ignored the report entirely, aided by a powerful global-warming-denial lobby which promotes junk science produced by industry-sponsored research. We then turned our attention to the amply published consensus of the world's scientific academies: that global climate change is taking place, and that it poses a threat to life on this planet and to human civilization in particular. Then we reviewed some of the hard evidence of industry-induced climate change as reported by the Intergovernmental Panel on Climate Change (IPCC) in their voluminous report, Climate Change 2001.1 Finally, we looked at some of the present costs of global climate change — in monetary terms, in environmental terms, and in terms of human life. Large bodies of water — particularly the oceans and seas — have a moderating effect upon the weather. As anyone living on an island or near the seashore is well aware, the summers in such an area tend to be cooler than farther inland, and the winters tend to be warmer. As a resident of the state of Michigan, I am well aware that an Alberta clipper which will freeze North Dakota and Minnesota down to -20º F, will be warmed sufficiently upon crossing over Lake Michigan so that this same weather system will only drop Michigan 's temperature down to 0º F. This is because bodies of water tend to have less seasonal variance in their temperature than does stone or soil, and they interact with overriding air masses to transfer heat from one to the other. This process is much more complex in the oceans than in the Great Lakes. Ocean currents channel warm water from the equator and cold water from the polar regions, with considerable effect upon local weather. Warm waters flowing up from the South Pacific bring heat to the Pacific Northwest and the Alaska Panhandle through the winter, leading directly to the temperate rainforests which dominate the ecology of this area. Meteorologists have traditionally ignored the oceans' role in meteorological processes. And this would seem to make sense on the face of it: if you are studying the weather it is natural to focus on the atmosphere, not the oceans. But we are coming to understand that the oceans are an equal partner with the atmosphere in producing the weather, and the dominant partner with regard to long-range weather patterns. But a series of global ship-based observations in the 1990s revealed that the ocean has warmed at depth since similar observations were last made in the 1950s. It turns out that this heat difference corresponds to about half of the greenhouse warming that had been projected by models but had been missing from actual measurements of the atmosphere. Meteorological models had not accounted for the capacity of the oceans to store large quantities of heat on short timescales.3 This capacity has been accounted for in more recent models, with the result that they are now much more accurate in their reproduction of long term heating and cooling trends. The oceans could accurately be called the long-term memory of the Earth's climate system. The atmosphere is as fickle as it is dynamic. It lacks the permanence to produce decadal patterns. The oceans, however, host a variety of long-term cycles which can and do affect the weather. Everyone has heard of El Niño and La Niña. Caused by the movement of warm water in the tropical Pacific — particularly off the coast of equatorial South America — these periodic three to five year disruptions are fully monitored by a system of buoys, so that they can now be predicted up to a year in advance. Yet these two phenomena represent only a small fraction of the influence which periodic ocean cycles exert upon the temperature and rainfall over North America. The variability of winter weather is highly correlated to long-term ocean cycles known as the Pacific Decadal Oscillation (PDO) and the North Atlantic Oscillation (NAO). The NAO, in particular, has a much stronger influence over the weather of the Eastern United States than does El Niño. Yet both of these long-term cycles are poorly monitored. Likewise, it is the oceans which regulate the hydrological cycle. A diversion of only 1% of the rainfall currently falling on the Atlantic would double the discharge of the Mississippi River.4 At the other end of the spectrum, an increase of rainfall over the oceans, particularly over key areas such as the Labrador Sea and the North Atlantic, could disrupt the thermohaline circulation of the oceans, with a drastic and immediate effect upon the climate of North America and Europe. The climate is a dynamic and sensitive energy exchange system held in a self-regulating equilibrium. The interactions of water and air have always been difficult to predict because they're governed by the branch of physics called fluid dynamics, whose recent mathematical formalism is called chaos theory. It's a description of the way that chaotic systems tend to magnify the effects of initially small changes. Depending on the stability of the system, proliferating changes can be compensated for by mechanisms that reestablish equilibrium, or they can overwhelm the system. In the latter case, the result is either a permanent disequilibrium, or a new equilibrium markedly different from the old. Any attempt at large-scale weather manipulation without a reliable model would be like driving down a mountain road with the windows blackened out using a roadmap whose reliability decreases progressively the farther you venture from your point of departure. The problem with modeling weather patterns is that there are simply too many variables. Many of these variables, such as the NAO and the PDO, are not well understood and are poorly monitored. Even if computer power continues to increase by an order of magnitude every 6 years, it would take over 160 years before models would have sufficient capacity to simulate the smallest ocean mixing processes. So predictive climate modeling is constrained by two intractable problems: the limitations of our computational equipment, and the inherent uncertainty of the data we put into it. In a different discipline, small initial errors might be averaged out or otherwise corrected-for. But in a domain like the weather – where the behavior of turbulent fluids is influenced by myriad variables all mutually interacting – the smallest numerical error can become enormous as it propagates through the model. If I want to know my county's surface temperature, pressure, rainfall and wind-speed a week in advance, I had better be rigorously correct about the numbers I put into my computer at the beginning. Taken from Abrupt Climate Change; should we be worried? This global current could be said to originate in the seas which ring the North Atlantic —the Labrador, Irminger and Greenland Seas, where the oceans release large amounts of heat into the cold atmosphere. Evaporation, which has been occurring throughout the North Atlantic, is here increased to the point that these northern waters constitute the saltiest waters in the oceans. The concentration of salts results in a denser solution, as does the loss of heat. And this denser water sinks to the ocean abyss, where it begins a slow migration back down the Atlantic and eastward into the Indian and Pacific Oceans. There it wells up, having lost much of its salinity. Displaced by colder waters moving under it and heated by contact with warmer flows from above, the formerly deep water rises toward the surface and picks up additional heat along the return journey into the Atlantic. Unfortunately, the ocean conveyer does have an Achilles heel. And this Achilles heel lies in the Northern Atlantic region where the deep limb of the ocean conveyer originates, drawing warm equatorial waters to replace it. If the cold, salty, dense waters of the North Atlantic somehow failed to sink, then the global circulation could slacken and halt. Currents would weaken and/or be redirected, with potentially catastrophic consequences for the whole biosphere. The resultant mini-ice age in North America and Northern Europe — and droughts elsewhere in the world — could continue for decades or even centuries, until conditions change sufficiently for thermohaline circulation to resume. Further, this localized mini-ice age might occur even as the Earth, on average, continues to warm.10 As a result, once thermohaline circulation resumed, the Northern Atlantic region could be thrown from one extreme to the other — from an ice age to a hot house. All that is necessary for this scenario to occur is an influx of fresh water into the surface of the North Atlantic . This buoyant, fresh water would virtually seal off and insulate the denser, saltier waters, preventing them from venting heat and moisture into the atmosphere. The fresh waters would also dilute the salinity of the North Atlantic, further reducing the density of these waters. The force driving the deep limb of the ocean conveyer would quickly weaken and halt. And the cessation of thermohaline circulation would quickly impact the world's climates. This scenario could take place in a decade or less from the time that fresh water influx in the Northern Atlantic reaches a critical threshold. Unfortunately, though scientists are certain that such a threshold exists, not enough research has been done thus far to determine where this threshold is. Oceanographers have complained that we do not have a system in place to monitor slowly developing ocean circulation changes. While we have thousands of meteorological stations recording temperature on land and in the atmosphere, we have only three sites with anything like a continuous deep record of the North Atlantic. And these sites only make observations once per month.11 Satellites can monitor ocean circulation globally, but only at the surface. For measurements at depth, we need a network of buoys and current-monitoring vessels. Oceanographers reporting in Nature, in 2002, concluded that a dramatic influx of fresh water into the North Atlantic has taken place continuously within the past forty years, and has accelerated within the last decade.12 This is the largest and most dramatic change in the oceans in the era of modern instruments. So far, the influx has been dispersed throughout the water column. But it is noticeably diluting salinity.13 And, at some point, the continuing influx may begin to pile up at the surface of the North Atlantic. An earlier report in Nature observed that the flow of cold, dense water from the Greenland and Norwegian Seas has slowed by 20% since 1950.14 This indicates that a slowdown of the ocean conveyer may already be occurring. An observation system must be put into place before we can better assess the impact of these developments on thermohaline circulation, and the rate at which the ocean conveyer may be disrupted. Until very recently, scientists believed that major climate change could only occur gradually, over long periods of time. The study of ice cores drilled in Greenland, Antarctica and in alpine glaciers around the world has changed that thinking. These ice cores hold a wealth of information. Aside from a record of annual snowfall, the ice cores hold spores and pollens, and volcanic ash. Also found in tiny inclusions in the glacial ice are trapped remnants of the atmosphere from thousands of years past. These gas inclusions can be analyzed to give an accurate measure of the chemical makeup of the Earth's atmosphere over the course of centuries. It is the study of carbon dioxide levels, as recorded in the air bubbles of these ice cores, which has established the ineluctable proof of industry-induced global climate change. Thanks to these ice cores, we now have a detailed history of the Earth's climate stretching back nearly twenty thousand years. Reading the ice cores is somewhat similar to reading the growth rings on a tree, but complicated because the yearly layers of ice have been contorted and folded by pressure and ice flow. However, with the help of some applied physics and structural geology, the layers can be unfolded and the record can be read accurately. This endeavor has already yielded remarkable scientific results, including the discovery that abrupt climate change has already occurred in previous eras. In the last fifteen thousand years, there have been several periods of abrupt climate change of varying severity and duration. Let's review four of these abrupt climate change episodes. Taken from The Two-Mile Time Machine, Richard B. Alley. Study of the Younger Dryas in particular has led scientists to conclude that there are preferred states of balance in the atmosphere. Should one state be tipped sufficiently out of balance, the atmosphere will cross some critical but unknown threshold and will then transition quickly to another state of balance. This thinking has revolutionized our view of climate change, and holds important implications for industry-induced climate change. Modern civilization, with its technological ingenuity, may be more capable of withstanding an abrupt climate change event than were these ancient civilizations. However, if abrupt climate change happens at a time when modern civilization is already suffering from resource depletion — particularly the depletion of its hydrocarbon energy base — the effect of such a double impact upon our civilization could be very grave indeed. In the past, when abrupt climate change rendered one area uninhabitable, people could migrate to another area. In today's world, that is no longer possible. The pathways associated with the transformation of warm subtropical waters into colder subpolar and polar waters in the northern North Atlantic. Along the subpolar gyre pathway the red to yellow transition indicates the cooling to Labrador Sea Water, which flows back to the subtropical gyre in the west as an intermediate depth current (yellow). 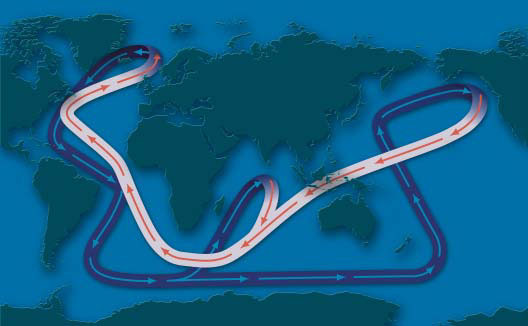 In the Norwegian and Greenland Seas the red to blue/purple transitions indicate the transformation to a variety of colder waters that spill southwards across the shallow ridge system connecting northern Europe, Iceland, Green-land, and northern North America. These overflows form up into a deep current also flowing back to the subtropics (purple), but beneath the Labrador Sea Water. The green pathway also indicates cold waters—but so influenced by continental runnoff as to remain light and near the sea surface on the continental shelf. Researchers believe the cause of this slowing is a reduction in the temperature differential between water from the Labrador Sea and waters from the Atlantic. Labrador Sea waters in the core of the gyre appear to have warmed during the 1990s, reducing the contrast with waters from warmer southern latitudes.28 This temperature differential is a major part of the driving force for ocean circulation. The final installment of this series will look at the possibility of runaway global warming, and the implications of Peak Oil and the North American Natural Gas Cliff. 5) Chaos: making a new science, Gleick, James. Viking Press, 1987. 6) Op. Cit. See note 2. 11) Op. Cit. See note 2. 12) Rapid freshening of the deep North Atlantic Ocean over the past four decades, Dickson, Bob, et al. Nature, vol. 416; April 25th, 2002. 14) Decreasing overflow from the Nordic Seas into the Atlantic Ocean through the Faroe Bank Channel since 1950, Hansen, B, et al. Nature, vol. 411; June 21st, 2001. 15) The Two-Mile Time Machine, Richard B. Alley. Princeton University Press, 2000 (reprint edition 2002). 16) Structure of the 8200-year cold event revealed by a speleothem trace element record, Baldini, J.U.L., McDermott, F., Fairchild, I.J. Science 296: 2203-2206; 2002. 18) Was there a Medieval Warm Period? Hughes, M.K., & Diaz, H.F. Climatic Change, Vol. 26, p. 109-142, March 1994. 19) Op. Cit. See note 17. 20) The Little Ice Age: How Climate made History 1300-1850, Fagan, Brian. Basic Books, 2000. 21) Volcanic dust, sunspots, and temperature trends, Schneider, S. H., and C. Mass. Science, 190:741-746; 1975. 22) Op. Cit. See note 20. 23) What Drives Societal Collapse? Weiss, Harvey & Bradley, Raymond S. Science, 291: 609-610; 2001. 29) Op. Cit. See note 27.